I have enjoyed being at home and hanging out with my kids this summer! I love not having to be on a rigid schedule! I love going to the pool in the mornings and just hanging out in the warm sun! I love not fixing my hair everyday...yea..for ponytails!! 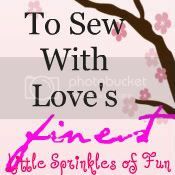 I love having the chance to blog and craft more often! I love having the time to take my kids to library story time! I am sure that I could keep going, but those are the main ones! What are you thankful for today? This idea came from two of my Kinder co-workers! Of course, it looked so COOL and FUN that I had to join in! Most of you are probably familiar with the old warming trays. This is what they look like. You can find these old warming trays at thrift shops. The 4 that I have I have found at The Salvation Army and Goodwill. Basically, plug in the tray and it warms up. 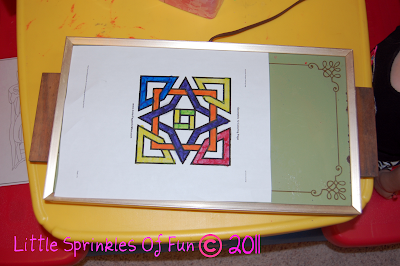 I will usually just print a color sheet off of the internet for the kids to color. 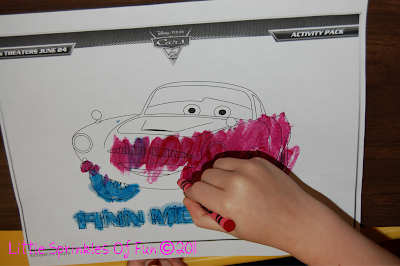 (In my classroom, we will color something that goes with the topic we are learning about.) The kids LOVE it and LOVE watching the crayons melt! WARNING: The tray does NOT get hot enough to burn, but the kids still need to be careful & supervised when using the warming trays. Totally Fun Tuesday/ What I am Working on…. Like I said..bittersweet…It really was time for a change! Change is good! (see I am just trying to convince myself..that this is a good thing!) Anyway, I have been at school trying to reorganize and set up a new classroom. It is hard when you have been in the same place for so long. The rooms are mostly the same, but not quite. The layout is different enough that you have to rethink your room layout. Okay, basically you just use a knife and cut these bad babies up! Mine are about 3-3 1/2 inches wide. In my classroom, the kids sort them by colors and by shapes. (some of the noodles were flower shaped) I also cut some long pieces of rope for them to string them onto to make patterns. I am sure there is more FUN to be had with these!! Just let your kids explore/play with them and see what they can think up to do with them!!! Keep a look-out for these to be on sale soon! I think I got these really cheap at the end of the season! I had some really ripe bananas sitting on the counter the other morning. I was trying to decide what I could do with them and for some reason Banana Pancakes came to mind. I have actually never had banana pancakes before, but I thought it would be worth trying. I goggled it and came up with this recipe. With a fork mash bananas leaving some lumps. Add in Bisquick and egg stir until just blended. Add in milk, cinnamon, vanilla & a pinch a nutmeg. Stir until blended there will be lumps from the banana. I did not put the nutmeg into the pancakes. I stuck with using just the vanilla and the cinnamon. I probably used a little more than 2 bananas also. As for the picture with the bananas on top…I did not tell my 6 year old that they had bananas IN the pancakes. I had asked him if he wanted Banana Pancakes and he said, “No”. Of course! Anyway…after they were made he told me that he did want bananas on top of his pancakes! I am not sure he even realized that they actually had bananas IN them! (JUST ON TOP!) LOL! Okay, I have tons of things in mind that will eventually be made over! However, I am behind on getting any projects finished....ummm or started. I have been too busy enjoying my summer off with my kids! I passed by the first time, and could not resist going back for them. So now I have a box of about 125 of these plastic straws. I have been brainstorming good ways to re- use these. I was trying to think of a way to use them in my classroom with the kids. So far I have only come up with a couple of ideas. I don't know...my creative juices are not flowing on this one yet! So sorry I have not been actively blogging lately. I have been spending several hours of my day at swimming lessons. Every year since my kids were babies we have gone to what is known as The Swim Ranch for lessons. They are wonderful! It is always a hot week sitting in the sun, but it is always lots of fun and well worth our time! Here are a few pictures of the Swim Ranch! I love the look and feel of this old place! So many fun memories made here! If you have not visited this blog, head on over and check it out! Plus, you can link up your blog to the Weekend Hoppers Party! Okay..I know that it is not really Wednesday, but I wanted to post this anyway! The kids and I have been having fun and enjoying our summer! We have been pretty busy the last couple of days, so my post just did not get finished on Wednesday! This Cute Girlie Flag Shirt! I found the tutorial here! She made this super tutorial that is very easy to follow! She did such a wonderful job...I found no need to recreate it! So if you are lookin' to whip up a cute girlie flag shirt hop on over! Oh, and if you want the cute little skirt to match, hop on over to Walmart! It was a quite a bargain at $2.50! It goes great with the cute little flag shirt! 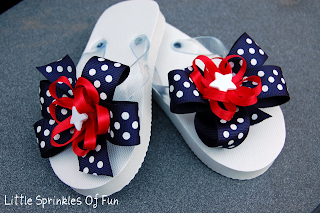 Oh, and I made these cute flip flops to match! 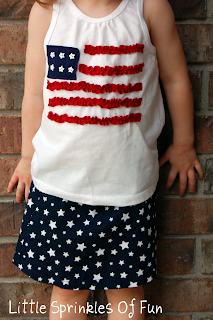 My daughter is ready to celebrate the 4th!